This post was updated on July 17, 2016 with new photos. Everything else remains the same! 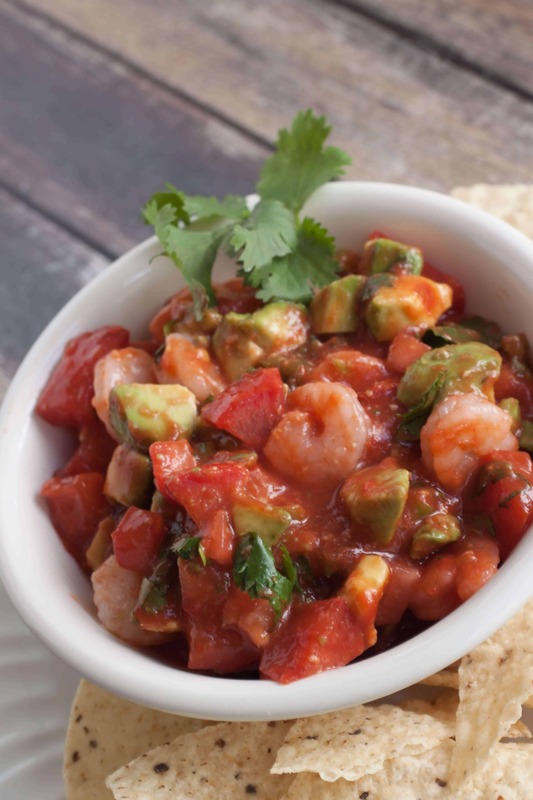 And this Shrimp Avocado Salsa is still yummy as ever! I’m not really sure when I first saw the movie Jaws. Or if I ever saw the whole thing actually, as I was pretty young when it came out. But there’s no doubt that even if you’ve never seen it, pretty much everyone knows what infamous music means when you hear it and that classic beat and the phrase “There’s something in the water.” In doing a little research, I discovered that the summer it came out, it set all kinds of box-office records. It also helped set off the successful career of an otherwise relatively unknown director at the time, Steven Spielberg. My husband and decided to watch it again recently (I got a copy of it from the library) and let’s just say, movie making has come a long way in terms of special effects! But we enjoyed it and it was fun to imagine what all the hype would have been like when it first came out. 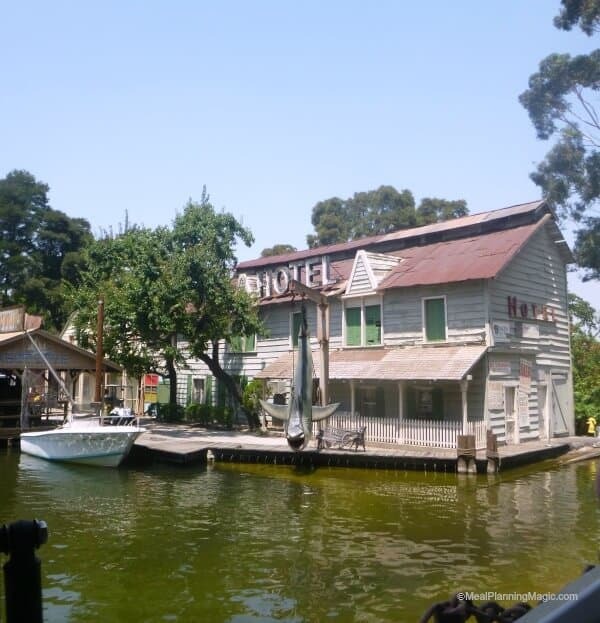 Over the summer, my family visited Universal Studios Hollywood and we saw the set they had there of the Jaws shark and beach town. I remember seeing that as a kid. And if you’ve ever been there you know there is another surprise in the water. It was just the same as I remembered! So this month, I decided I to share a recipe I’ve been wanting to share with you all for a while. An old neighbor of ours served this Shrimp Avocado Salsa at a get together and it was SO delicious. It kind of reminds me of a ceviche, but everything is cooked before combining. Aside from all the chopping, this is such an easy recipe to make and it makes a lot—perfect for a crowd! Plus, it’s pretty healthy for you too. We love to enjoy it with tortilla chips, but I’ve been known to eat it by the spoonful too! I hope you’ll give this shrimp avocado salsa recipe a try. 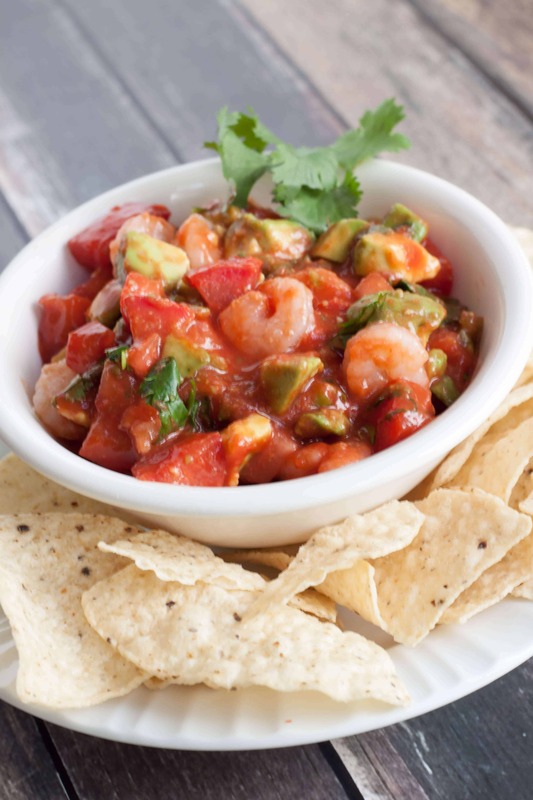 This simple Shrimp Avocado Salsa recipe is an easy and delicious version of ceviche and perfect for any crowd! Serve as an appetizer or healthy snack. 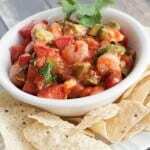 Combine the shrimp, avocados, tomatoes, cilantro, green onions, jalapeno chilies and lime juice in a bowl and mix gently. Stir in the seafood sauce, ketchup and salt. Chill, covered, until serving time. Serve with tortilla chips. Kirsten over at KirstenOliphant.com hosting this month’s Blog Film Food event! 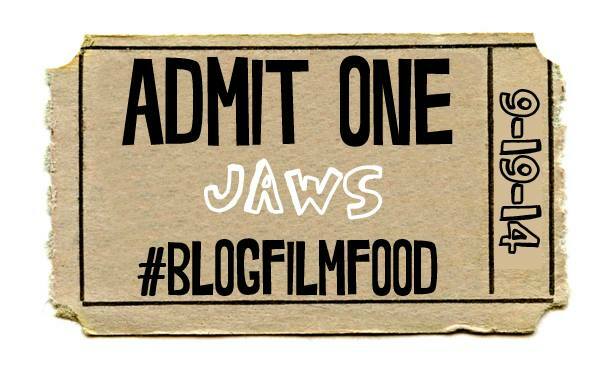 Don’t forget to check out everyone else’s recipes this month so you can start planning your own Film and Food Night Out! ◦Kelley from The Grant Life: Mixing food and family. 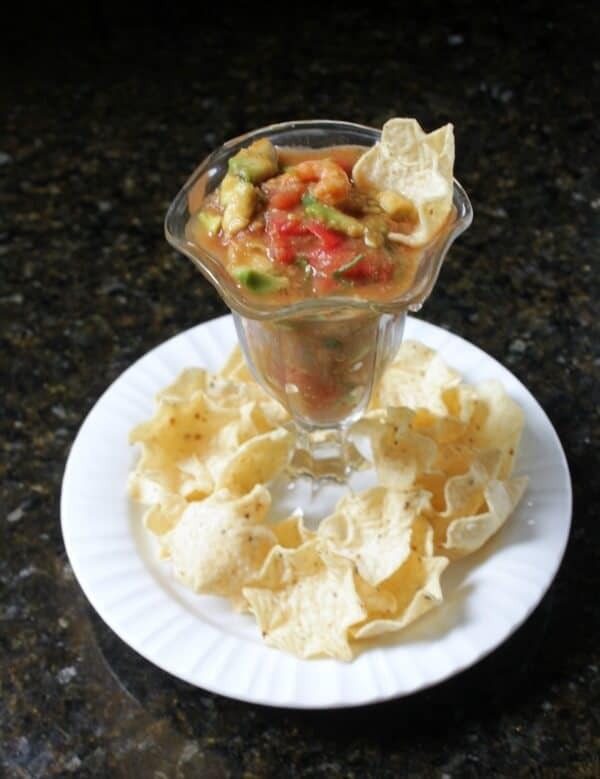 ◦Kelli from Eat Pray Read Love shares her Thai Shrimp Soup. ◦Kirsten from Kirsten Oliphant shares her Easy Fish Tacos. ◦Miranda from Involuntary Housewife shares her Shark Bait Soother. « 12 Weeks of Christmas Treats – 2014 Edition! That sounds delicious!! I would love to hit up the Universal Studio tour just because it’s so famous! Can’t wait to try this. Thanks! And it really is SO easy to put together. Universal Studios is a must-do IMO! Thanks! They really are so tasty!